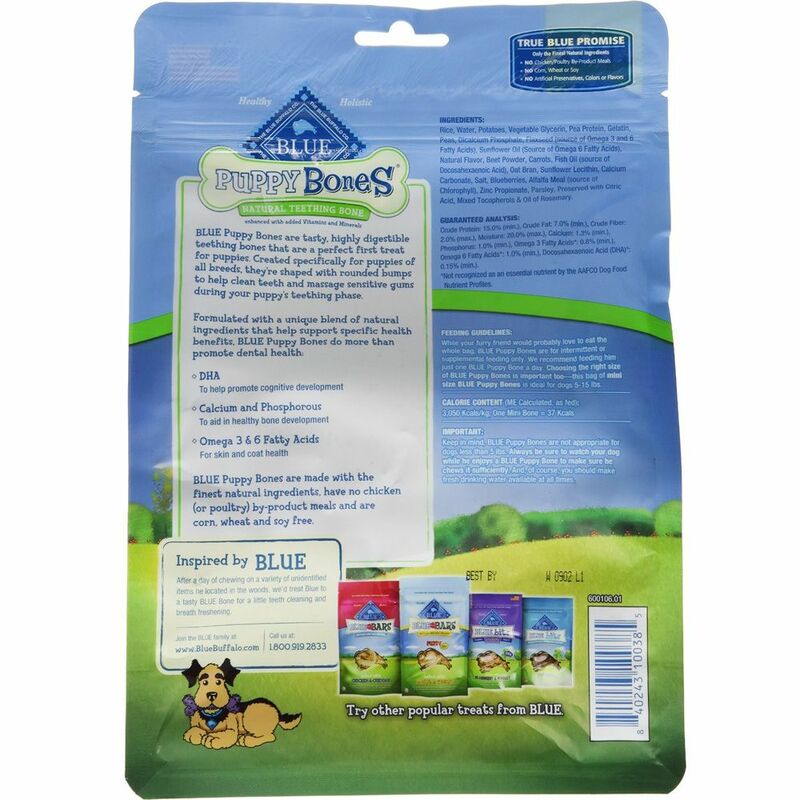 Blue Buffalo™ Dental Bones Puppy - Mini will satisfy your puppy’s natural chewing instinct and are a great way to start him on a lifetime of dental health. Blue Puppy Dental Bones include minerals and supplements which can help support his overall development. 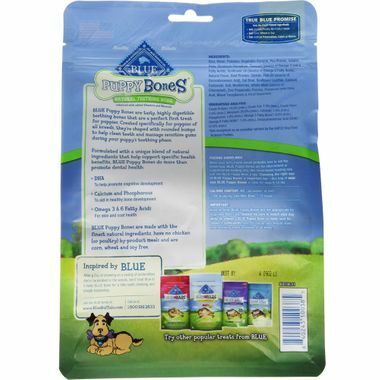 BLUE Puppy Dental Bones are made with the finest natural ingredients, have no chicken (or poultry) by-product meals, and are corn, wheat and soy free. Rice, Water, Potatoes, Vegetable Glycerin, Pea Protein, Gelatin, Peas, Dicalcium Phosphate, Flaxseed (source of Omega 3 and 6 Fatty Acids), Sunflower Oil (source of Omega 6 Fatty Acids), Natural Flavor, Beet Powder, Carrots, Fish Oil (source of Docosahexaenoic Acid), Oat Bran, Sunflower Lecithin, Calcium Carbonate, Salt, Blueberries, Alfalfa Meal (source of Chlorophyll), Zinc Propionate, Parsley, preserved with Citric Acid and Mixed Tocopherols, Oil of Rosemary. While your furry friend would probably love to eat the whole bag, BLUE Puppy Dental Bones are for intermittent or supplemental feeding only. We recommend feeding him just one BLUE Puppy Dental Bone a day. 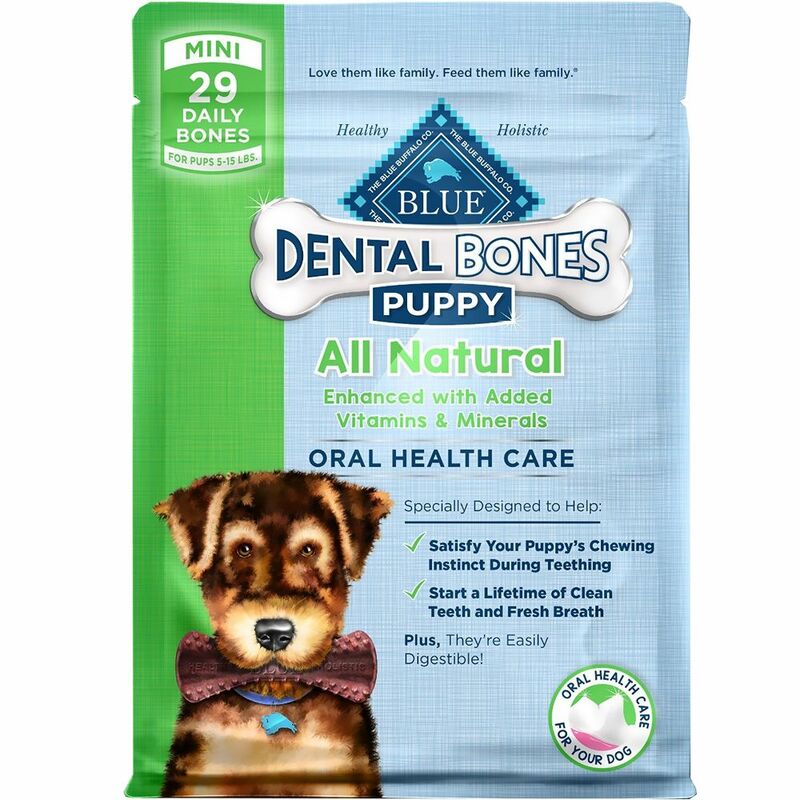 Choosing the right size of BLUE Puppy Dental Bones is important too—this bag of regular size BLUE Puppy Dental Bones is ideal for dogs 25-50 lbs. Keep in mind, BLUE Puppy Dental Bones are not appropriate for dogs less than 5 lbs. Always be sure to watch your dog while he enjoys a BLUE Puppy Dental Bone to make sure he chews it sufficiently. And, of course, you should make fresh drinking water available at all times.